Railways for public traffic, normal tracks and narrowguage. ÖSlJ’s collection of engines and wagons give a reasonable picture of how the development of Swedish rollingstock on 600 mm gauge railways progressed during their hayday. Only a limited amount of vehicles are missing from the rollingstock to make the collection complete. Most of our rollingstock comes from 7 railways with 600 mm gauge that had sanctioned passenger traffic and some of the other rollingstock comes from a varied group of industrial lines with the same guage. Seven tiny railways transporting freight and passengers beetwen 1891 and the second world war. Sweden had seven 600 mm gauge common carrier railways. Four were built to transport freight – Kosta’s glass-wares, Anneberg’s matches, Stafsjö’s timber and Munkedal’s paper goods. The passenger coaches were mainly used by workmen and locals. The Helsingborg line hauled bathers to Ramlösa. 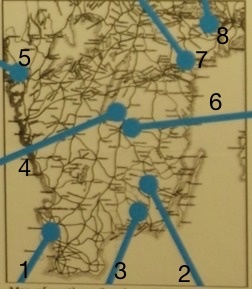 The Jönköping - Gripenberg and Nättraby lines were truly all-round, connecting rural and urban areas for the benefit of enterprise and inhabitants alike. The Munkedal Railway was 5 km, the Nättraby line the longest at 49 km. These lines thus differed widely, in spite of having the same gauge – but they all contributed to the rapid transformation of local rural society from the 1890s until the 1930s. The Kosta line came first of them all, it opened for public traffic in 1891. The Munkedal Railway outlived WWII and was rebuilt to standard gauge in 1955. For a good 20 years, between 1909 and 1931, all seven lines operated as common carriers. By comparison, our museum railway, ÖSlJ, has existed for more than 50 years! Rolling stock on the ÖSlJ consists of engines, coaches and freight stock from all of these seven railways. In general, our trains mix coaches and freight wagons, just as our prototype lines did. However, no regular freight haulage takes place on our railway, so the wagons are included in the train to illustrate what it meant to travel with a small Swedish narrow gauge railway at the beginning of the 20th century. Normal track: has 1435 mm between the inside of the rails. Tips to remember were the same figures as the Arboga Parliament (1435). Narrowgauge: Other track widths are narrower than 1435 mm. The common narrow tracks in Sweden were 1067 mm, 891 mm and 600 mm. Wide track: has a greater track width than 1435 mm and is available in Finland and Russia, 1524 mm, and in Spain with 1668 mm. Where were the seven 600 railways?